Is that a gorgeous cover, or what? How it is selling, as yet I have no idea. On Amazon, not very much, but I am told that it is not a "major channel" in British trade publishing sales, and the fact is that a first novel depends heavily on old fashioned sales off the bookstore shelves. A public acknowledgement and thanks is due - and overdue - to Tamora Pierce, official Friend of this Blog, and the faerie godmother of Catherine over many years. Also to blog reader and occasional commenter Anita, who originally worked out the genealogy at the front of the book. But I assert sole credit for mistakes. I should also tip my hat to a reader, 'Gracie,' who posted a wonderful reader review at Amazon. Five stars are always wonderful, but her elegant and insightful comments even more so. Courage and panache, indeed! And also a tip of hat to a couple hundred of Tammy's fans who responded to her wonderiffic Goodreads review by putting CoL on their to-be-read lists. As I've noted here previously, the life sciences tend to get relatively short shrift in space discussions. I rarely remember life support ecology getting anything like the detailed discussion given to shiny stuff like propulsion systems. But these things matter, as I have been reminded by being diagnosed with diabetes (type 2 - the kind that doesn't require daily insulin), AKA the American disease, the result of a lifetime of bad dietary habits coming back to bite me. I seem to be responding well to treatment, but one effect of the disease, relevant to this blog, is fatigue. So, as treatment progresses, I hope to overcome that and start posting here more frequently. Those loyal readers who still drop by here from time to time will surely (?) be glad to hear that I have lately been reading and thinking more about space again. I hope to post some of the results here soon. 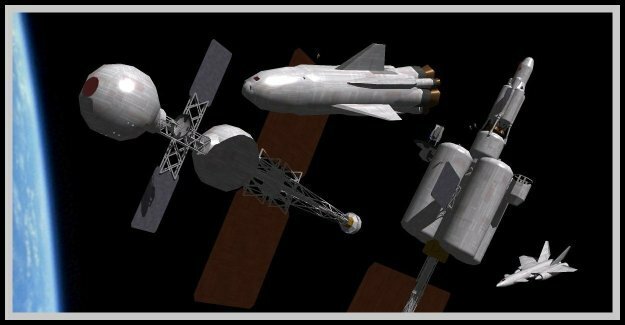 Meanwhile, I encourage everyone to (re)visit the wonderful Atomic Rockets website, which has been greatly expanded over the past few years even as this blog went relatively quiescent. The moving finger can even, as in this case, return after an indecently long interval to write more. But most to the point, the moving finger, by hitting the publish button, establishes canon. What previously were tentative, fluid possibilities are transformed into either fixed facts or equally fixed nullities. Even the digital era has not, so far, changed this in essentials - ebook editions, at least from commercial publishers, are as fixed as their print counterparts. Thus, in the course of the spring, Catherine of Lyonesse has taken on its final, official form, the text gradually setting like concrete. Events and details that previously were fluid, contingent, subject to revision, are now fixed in place beyond the reach of piety or wit. Now they are canonical, or will be come the official publication date - August 14 - and the release of the book. This effect of canonicity does not depend on the technology of print: Omar Khayyam wrote long before the printing press. But print - generating numerous identical copies of a text - surely amplifies this effect. Getting the first couple of copies of C of L off the print run was a wondefully solid experience. Even more wonderfully the copies smell like books. And the canonical version is right there in cold print. In Catherine of Lyonesse I did little worldbuilding of the classic SF/F sort. The world of the book is meant to be evocative of our own, similar enough that the mechanics did not need to be worked out and tested for fit. The population and technology of Renaissance France were sufficient to support the French royal court; given a comparable kingdom, the royal court of Aquitaine did not need to be explained, only invented. As a result, I nearly got caught by a stray round of canon fire. 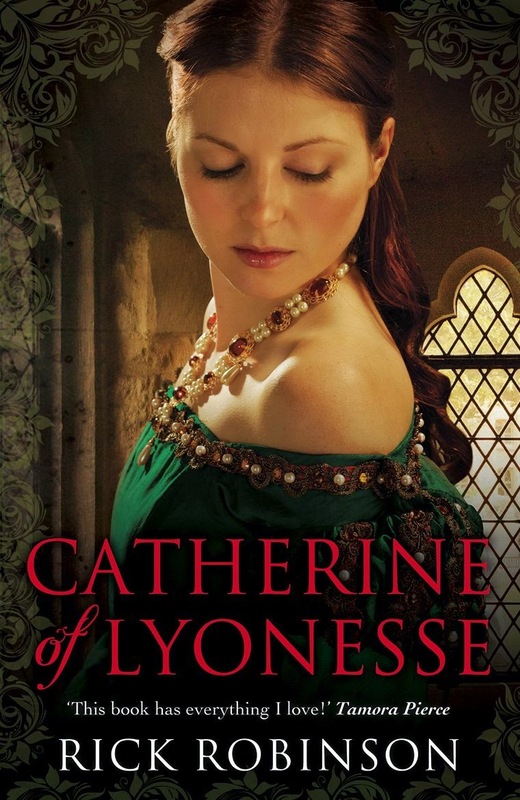 At some point in writing the manuscript I needed to mention a former king of Lyonesse, one of Catherine's ancestors, and made him Edmund II. The name was intended simply to evoke the Edwards of Plantagenet England. Much later in the process I drew up a family tree, and merely listing successive kings hinted at a background arc: a failed king; a son who conciliates his subjects; a grandson who takes advantage of the revitalized monarchy to beat up on the neighbors. And so it turned out that the Agincourt-esque battle mentioned in the book would fit better with Edmund III. By then I'd long forgotten that the manuscript itself still said Edmund II. I didn't catch the mistake until the very end of the proofing process. Did it even matter? Within the book itself, not at all. Nothing in the text would tell the reader that Edmund le Conquérant should refer to Edmund III, not his father, "Good King" Edmund II - who is not mentioned in the book at all, not even indirectly. But if I had not caught the discrepancy, I would have been put in a slightly odd quandary going forward. If there is a sequel, it probably will mention Good King Edmund. But then, which Edmund would he be? Would I keep the history arc I inferred from the genealogy, and ignore the regnal number given in the first book? Or accept the printed text as canon, and mentally reconstruct the dynastic history to fit? Since I did catch the discrepancy before the book went to cold hard print, I was spared that sort of reconning. At least in this case. No doubt further journeys in sequel-land will reveal things I'll wish I had done differently in the first book, but that is a different matter. More elaborately constructed worlds give their authors a better chance to catch mistakes - but also expand the universe of possible mistakes, so the tradeoff is probably a wash. And canonicity itself is arguably a geek obsession. Major sloppiness in a setting can break the spell - the willing suspension of disbelief - especially if readers can't be sure what merely factual matters in the story they can rely on. But most concerns about canon are just pedantry fuel. Which won't keep me from fretting about them. 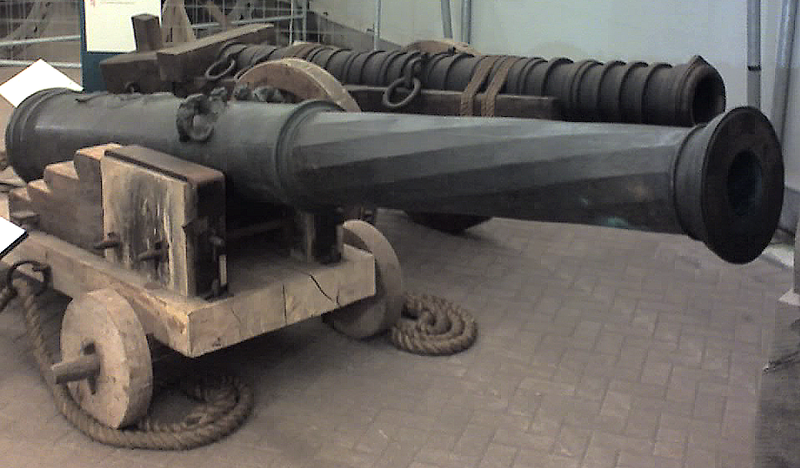 The image, via Wikipedia, shows modern reproductions of 16th century naval guns from the wreck of Henry VIII's Mary Rose. Not to belabor the obvious, but I have taken a long and unplanned vacation from this blog. After more than six years it has become a challenge to come up with topics that have not already been beaten to death here. So I will make absolutely no promises about frequency or consistency of posting, but here you go! There is a curious enchantment to Dark Ages. They are dark mainly to us, with few if any written records, yet they loom large in our imaginative heritage. The Dark Age of Greece - by convention it is in the singular, not 'Dark Ages' - might be dated with traditionalist pseudo-precision as running from 1174 BC to 776 BC. The end date is the first Olympiad, the earliest recorded date of 'historical' Greece. The start date is ten years after the fall of Troy, when Odysseus finally gets back to Ithaca, last of all the surviving Achaean heroes to make his way home. The traditional dates for the Trojan War itself, 1194-1184 BC, were an estimate by Eratosthenes, better known in geekdom for his impressively accurate computation of the size of the Earth. But the first curious thing about the Dark Age of Greece is that his date for the fall of Troy is also impressively accurate, even though it was based on premises that were shaky, obscure, or both. The current archeological dating for the destruction of Troy VIIa - a destruction apparently due to war - is given as 1230-1190/1180 BCE, a range that just neatly overlaps the traditional date. True that Eratosthenes' dating was only one of several classical estimates for the fall of Troy, and if you include enough of the others you can make a plausible case that Eratosthenes merely got lucky. If you scatter a dozen estimates over a 200 or 300 year period, one of them is likely to fall within a couple of decades of any given date. But 1184 became the standard traditional date for the fall of Troy. Score one for Eratosthenes, not to mention Homer. To us the oddest episodes in the Odyssey may be when Odysseus' son Telemachus visits Sparta and finds Menelaus and Helen living in comfortable domesticity, as though all that awkward business about Paris of Troy had never happened. Other homecomings, the Nostoi in Greek tradition, were more turbulent. To judge by the archeological record, however, practically all of the homecomings must have gone badly. Every Mycenaean palace was destroyed, with the sole exception of the (rather minor) palace at Athens. As a further complication the wave of destruction - one scholar has dubbed it simply the Catastrophe - peaked right around 1200 BCE, slightly before the putative date of the Trojan War. What sticks most in my mind is sandy Pylos, the city of wise old Nestor. Telemachus also visited Pylos in his journey, where he found Nestor leading his people in sacrificing bulls (or was it oxen?) to Poseidon. All seems to be going well for the Pylians - if Homer had wanted Foreshadowings of Doom in his narrative, he could have provided them, and he doesn't. In fact, however, sandy Pylos went down in flames circa 1200 BCE. And unlike Mycenae, which struggled on through a couple of archeological destruction layers before final abandonment, Pylos went down for the count. Left in the smouldering ruins were clay tablets, fortuitously baked in the conflagration, on which scribes had carefully recorded all the unromantic details of Bronze Age palace management.They also provide the Foreshadowings of Doom that immortal Homer does not: Watchers have been dispatched to guard the coast, some 600 rowers are being mustered, and there are hints of an emergency human sacrifice. The fashion in the fairly recent past was to downplay any real connection between Bronze Age events and the Homeric tradition. The magisterial Moses I Finley dismissed any Bronze Age element in the epics as a mere few Mycenaean 'things.' Lately the scholarly fashion cycle seems to be going the other way, helped along by other fire-preserved clay tablets, from Hittite archives, that mention a place called Taruisa or Wilusa, and troublesome people called Ahhiyawa - evoking Troy, its alternate name Ilios, and the Achaeans, sackers of cities. For historical, or para-historical fiction, this would be more than enough. A lot of plausible reconstruction of events can be slipped through the error bars in archeological dating. If Troy fell in 1230 BCE, then whatever happened to Pylos happened a generation after Telemachus' visit, give or take, and had no reason to be hinted at in the Odyssey. Perhaps it belonged to a different story line. But that is the mystery and enchantment of the Greek Dark Age. Moses I Finley may have been wrong to dismiss 'Mycenaean things,' but he is right in saying not to judge a culture only by its material poverty. An oral tradition persisted and developed through its obscure generations. The tradition did not preserve everything. If there was ever an epic sung of the fiery end of Pylos, it vanished nearly without trace. (A sketchy account held that Nestor's descendents were exiled from Pylos, turned up in Athens, and eventually founded Ionia.) But the tradition did preserve some things, however much refracted by oral transmission. It is unlikely that we will ever find a source document that directly records the specific people and events that have come down to us as the wrath of Achilles and the wanderings of Odysseus. We glimpse them - vividly so - across a wine-dark sea of time. Obligatory space reference: When your subject is Odysseus, the Major Tom of Bronze Age heroes, you don't really need an obligatory space reference. But I provided one anyway. The image of an archaic era Greek galley comes from a Project Gutenberg ebook.